You will need Adobe Acrobat Reader (a free program) to view and print PDF files. If you do not have this program click on the icon below for a free download of this program. If you have any questions about the policies please contact the Newaygo County Road Commission office. Reduction of speeds (reduced to 35 mph) and weights (reduced by 35%) during the spring thaw. Permit or bonding of roads required for loads at full weight. Weights and speeds are reduced to prevent the damage to flexible based roads during the exit of frost from the ground. State law mandates the institution of weight restrictions on March 1st of every year. Individual counties can post weights before or after March 1st depending on weather conditions. All flexible based roads including gravel roads. For truck operators map or information, contact the Newaygo Co. Road Commission. Blanket permit will only allow trucks to and from the business or project site that the bond pertains to. This permit is only valid for the bonded road segment. A copy of the permit will be carried in vehicle(s) at all times. Newaygo Co. Road Commission reserves the right to revoke any bond to prevent further damage to roadway. Bonded segments of roadways will be inspected and documented before bonding and after weight restrictions are lifted. If any major damages have occurred within the bonded segment, Newaygo Co. Road Commission will use the bond money to repair the road and then will release what is left in the bond afterwards. If no damage has occurred, the bond in full amount will be released. Road restriction signage will not be removed from any bonded segment of roadway in order to protect you and the bond. Approved routes and times at $25.00 per vehicle. Newaygo Co. Road Commission may grant exemptions to milk haulers on specified routes when requested in writing. Approval or denial will be granted within 30 days after submission of permit application. 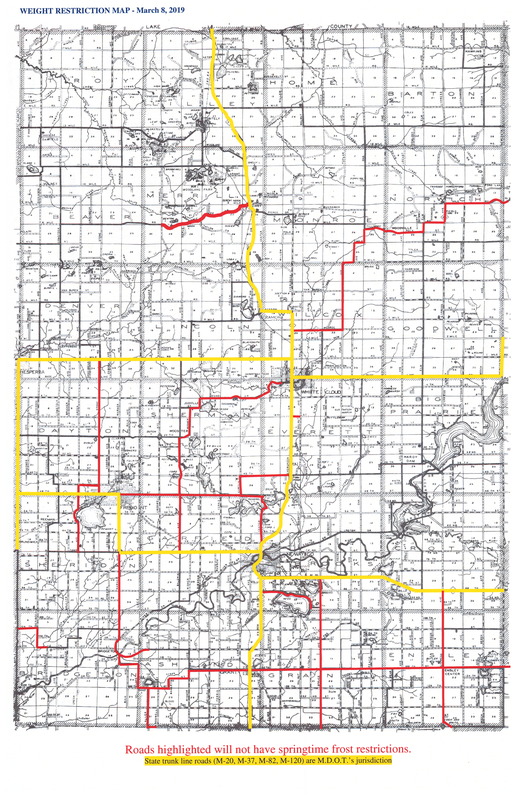 If request is denied, the written notice shall state the reason(s) for denial and alternate routes will be given that would be covered under the permit. $25.00 per day/ or per number of trips/ or for a certain time of day depending on the specific circumstances. Agricultural commodities includes those plants and animals useful to human beings, produced by agriculture and includes, but is not limited to, forages and sod crops, grains, and feed crops, field crops, dairy and dairy products, poultry and poultry products, cervidae, livestock, including breeding and grazing, equine, fish, and other aquacultural products, bees and fertilizer, livestock bedding, farming equipment, and fuel for agricultural use. The term “agricultural commodities” shall not include trees and lumber. These items include feeds and raw milk products and any other products that can or would spoil in a certain length of time. -Permit restrictions and fees will be same as milk hauling permits. Newaygo Co. Road Commission shall be notified not less than 48 hours before the pickup or delivery of the time and location of the pickup and delivery. Newaygo Co. Road Commission shall issue a permit and will not charge a fee that exceeds the administrative costs incurred. A permit shall contain the designated route(s) of travel, the date and time period requested, a maximum speed limit if necessary, and any other specific conditions agreed to by the parties. Maximum weight allowable is 35% less than the maximum axle loads. Any loads more than this weight restriction will need a permit. Advanced notice of 48 hours requested, not including Saturday or Sunday. There will be no permits granted verbally or by phone. Every permit will be documented. In certain emergencies such as loss of existing utilities or services, permits may be carried out by fax, with a hard copy being sent out immediately afterwards.